The Forest City Solar Project, owned by Butter Solar, LLC, is the first project to be developed for NativeEnergy’s New Renewables Portfolio. The Portfolio is designed to enable renewable energy buyers to play a causal role in creating new renewable energy generation. On behalf of Portfolio investors, NativeEnergy has committed to a 10 year renewables purchase agreement. This project is a 3.0 MW solar photovoltaic project connected to the City of Forest City electric grid. Located in the city of Forest City, Iowa, it consists of a ground-mounted contiguous array of ~11,908 individual photovoltaic panels. Project operating life is expected to be over 25 years. The City of Forest City Electric Utility will purchase the energy from the project under a 25-year common power purchase agreement (PPA) with the Upper Midwest Municipal Energy Group (UMMEG). The energy from the project will generate about 10% of the utility’s annual electricity consumption, and will displace prior contracted wholesale energy typically derived from a contract that delivers primarily coal-fired generation. Forest City expects to achieve significant savings compared to its current wholesale electricity supply agreement as a result of purchasing the output from the project, and these savings will be directly passed through to its ratepayers. The combination of the utility’s purchase of electricity and NativeEnergy’s purchase of RECs has enabled this project to move forward. The pre-project use of the land is for growing and harvesting of row crops (soybean and corn rotation). The existing landowners will be compensated for providing their land to the project at an amount higher than what they would receive for the crops. The estimated annual electrical production of the project is 6,000 MWh/year. 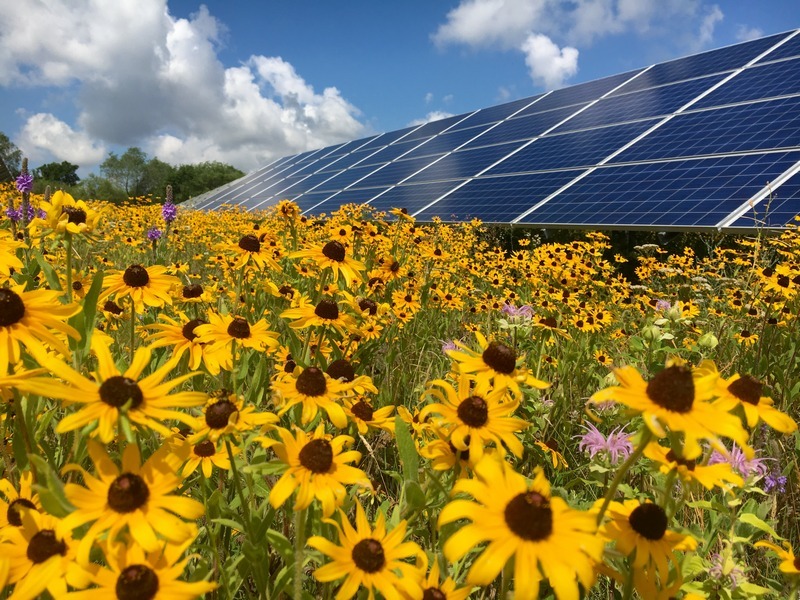 Vegetation beneath the solar arrays will be “pollinator-friendly,” low-growing, primarily native meadows. About a third of food crops are pollinated by bees or other pollinators, and with the corn/soy monocultures that occupy most of the landscape in the heartland, these species are experiencing rapid declines. The Project is working with Rob Davis at Fresh Energy to design pollinator habitat seed mixes that are science-based and conform to scorecards developed by researchers at the University of Wisconsin. The Project is also working with local beekeepers who would keep hives adjacent to the solar arrays to benefit from the habitat. An online portal that will track the electricity production of the project will be available for the public to view. This information will be made available to local schools as part of a broader campaign to educate local students about solar energy. Butter Solar, LLC, a wholly-owned subsidiary of BluEarth Renewables US LLC, is the owner and operator. OneEnergy Development, LLC developed the project. This project has received a Conditional Use Permit from the City of Forest City. No other permits were required.